You might have noticed that I've been contemplating re-entering the job market. Times are tough everywhere and it's hard to get back into the work cycle after being a stay at home mom. I mean that quite literally, since my resume has some gaping holes for the years I've spent without formal work experience, I look really sketchy on paper. Here in Wichita, it definitely seems like the people doing the hiring are more interested in where you've been than what you can do, so I've been wondering if I should take some classes just to refresh me on how to work. Colby Community College in western Kansas is holding a contest for to two bloggers to win an online scholarship for their Virtual Assistant certification. That's 32 credit hours, gratis! It seems like a good way to stay at home a little more productively while setting the work wheels in motion. 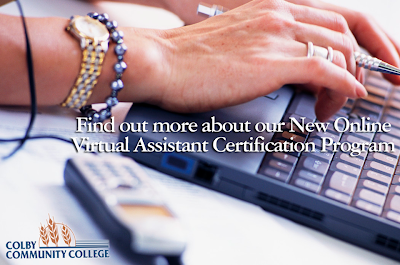 Have you thought about becoming a virtual assistant or have you used one in the past? I'm curious to hear your thoughts. In accordance to the FTC Guidelines and the WOMMA Code of Ethics, I am disclosing that this post was written as my entry into the scholarship contest. No compensation was provided. All opinions are, as usual, entirely my own.